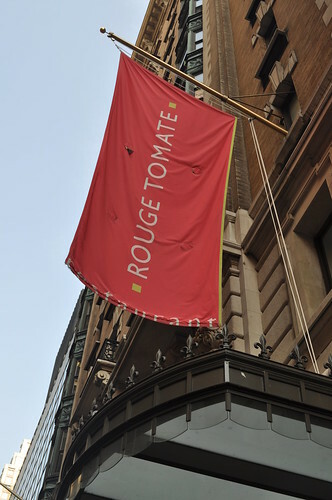 During the last day of NYC Summer Restaurant Week (before it was extended through Labor Day), Eleanor and I made reservations at Rouge Tomate, located in the Upper East Side. I had to e-mail the general manager for the menu, as it was not posted online anywhere. Its Restaurant Week menu offered dishes with many seasonal ingredients, so we decided to give it a try. Just as a brief history (see more details here), NYC Restaurant Week began in 1992 as a lunch-only (i.e., prix fixe menu offerings) as promotional event to welcome to Democratic National Convention (DNC) to New York City. 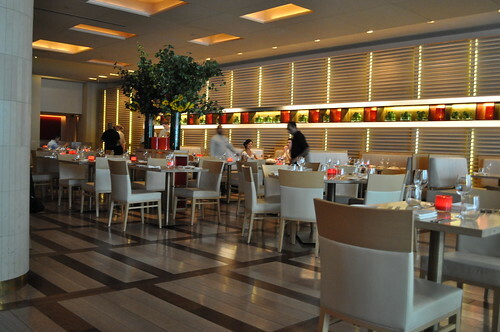 At the time, as a play on the year at the time, the lunch prix fixe 3-course offering was priced at $19.92. While it initially was created for DNC delegates and attendees, it became overwhelmingly popular among New Yorkers who were jumping at the chance to dine at some of NYC's highly rated restaurants for a fraction of the usual cost, who didn't want Restaurant Week to remain a one-time deal. Eighteen years later, Restaurant Week 3-course prix-fixe menu is offered twice annually--two weeks in January/February (i.e., Winter Restaurant Week) and two weeks in July/August (i.e., Summer Restaurant Week)--for lunch and dinner, at $24.07 and $35, respectively, depending on what participating restaurants wish to offer. View from upper level to lower level of Rouge Tomate. 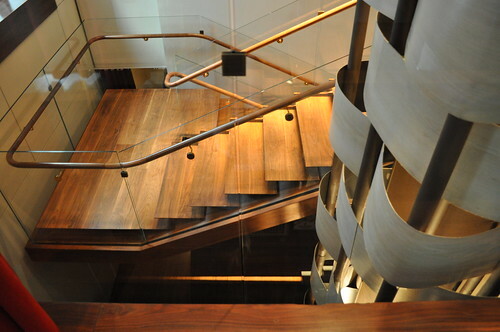 What an elegantly designed space! It has a very organic, which seems to add to the overall "seasonal/organic/sustainable" feel we got from the Restaurant Week menu. 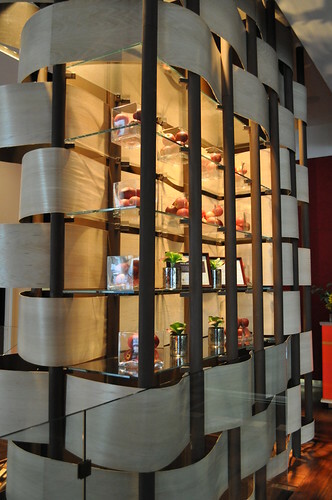 "Woven" display shelf at Rouge Tomate. Inside Rouge Tomate. I really like the use of lighter-colored woods and furniture. The accents of red and green also enhance the overall "organic" atmosphere that I mentioned earlier. We started with this amuse-bouche. 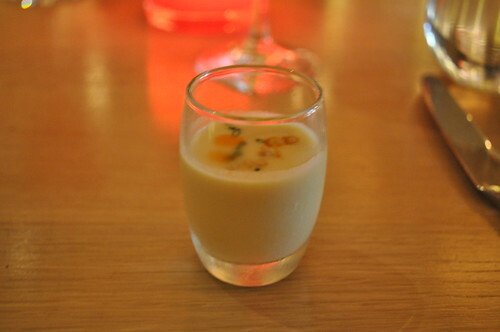 It was a chilled sweet corn soup (and some other ingredients I cannot clearly recall), and it was delicious. You can taste the sweetness of the corn, and the consistency was just right--not too runny or thick. A great way to start the meal! Eleanor began her prix fixe dinner with a sweet corn and avocado salad (she'll have to refresh my memory of what else was include in there). Very summer-ish flavors. Also, as a side note, Eleanor and I both ordered a glass of rosé sangria (as seen in above photo), a berry infused Rosé with watermelon, orange, and seltzer. It was definitely an interesting twist (with the Rosé) on sangria, using classic summer fruits, but I still traditional red/white sangria, with a nice red wine or a Riesling/sparkling white wine :]! 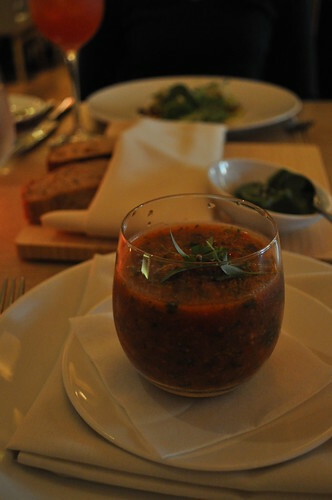 For my appetizer, I had a summer vegetable gazpacho. I've never really been a fan of chilled soups (the amuse-bouche above was great though), so I'm not really sure why I ordered this. I sort of went with my gut. I couldn't have more than 2-3 spoonfuls. It was too much. It seems unnatural for soup to be cold, unless prepared impeccably. It was like I was eating straight up salsa, sans chips. Definitely not recommended if you're not a gazpacho lover or even if you're on the fence about it. 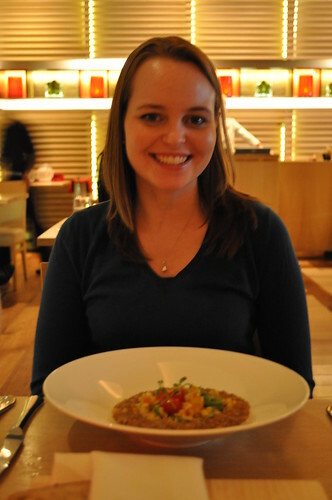 Eleanor ordered the farroto (prepared like a risotto but using farro) with summer corn and pepper. Farro, an Ancient Mediterranean whole grain, supposingly adds more flavor to dishes like risotto (which uses arborio rice) and is overall healthier--something I'd like to try and test in the future. Eleanor reported that this dish was very flavorful and prepared well, so we're two for three so far! I ordered the Berkshire pork loin a la Plancha with crushed potato, braised chard, stone fruit, and mostarda. 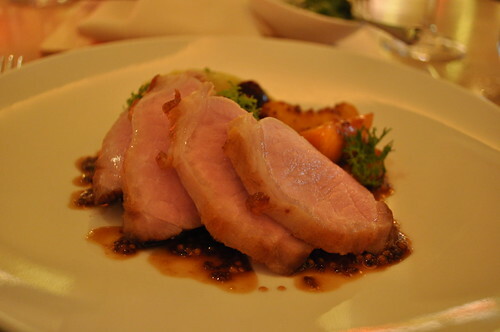 The pork loin was very tender (not overcooked at all), and the mostarda (an Italian condiment made of candied fruit with a mustard-flavored syrup) gave it a nice sweetness (along with the wedges of stone fruit) and spice to the pork. 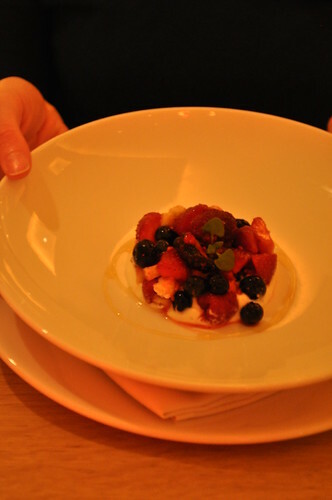 Eleanor decided on a summer fruit parfait/sorbet/ice cream dessert. Can't go wrong with fresh fruit and a little cream! 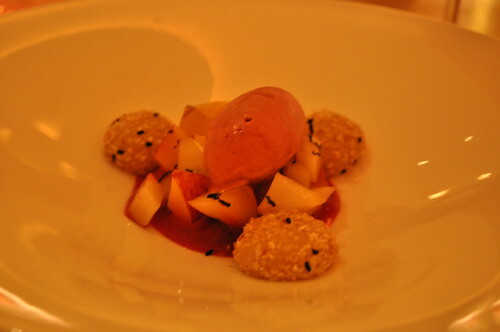 I selected the plum dessert dish as my last course which consisted of sticky rice balls, crystallized Ginger and plum-shiso sorbet. Very strong Asian flavors. I especially like how they threw in the stick rice balls (which I'm guessing is made from glutinous rice flour)--it added a level of authenticity to the dessert. While I enjoyed the flavor, it still seemed like there was too much going on in the dish at once. Sometimes that can enhance the overall experience in eating it, but it made it rather more confusing here. Overall, though, it had great flavor--just lacking in execution slightly. 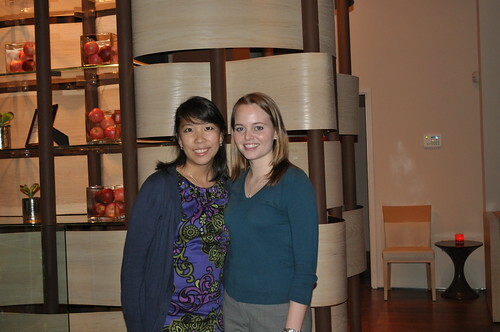 Me and Eleanor at Rouge Tomate--we finally remembered to take a photo together after dinner! Findings: All in all, I was a little disappointed. I think Linda put it best when she said that Restaurant Week tends to "water down" a restaurant's menu, mainly in order to fit the price parameter of $24.07 / $35. While I love the season fruits and drinks brought by summer, I'm more of a fall/autumn ingredient kind of girl. I would love to try Rouge Tomate's regular menu during the fall, where I find the produce and ingredient offerings to be richer, more flavorful and hearty, as well as more in variety. Nevertheless, Rouge Tomate creates an organic and beautiful atmosphere that I often don't see done this well. 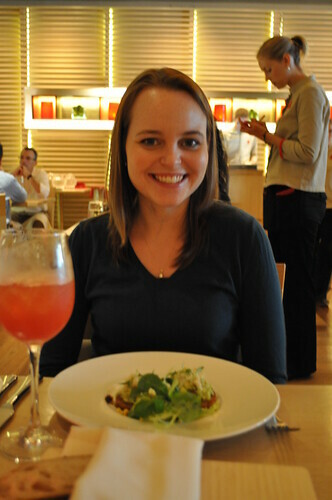 Plus, it was nice to finally catch up with Eleanor about life, our love of food and cooking, and everything else! Price point: $35 for a 3-course prix fixe dinner, brought to participating restaurants courtesy of NYC Summer Restaurant Week; $12 for a glass of rosé sangria.